21 November 2018, at 12:00a.m. By the week ended 11 November the measure stood at €135.77/100kg, having now recorded declines for ten consecutive weeks, and falling by €3 within the previous four weeks. The latest figure is around €10 below year earlier levels. Over recent weeks, reports indicate that supplies of pig meat in Europe have remained plentiful, while retail demand seems to be stable. Combined, this has added some pressure to the market, with African swine fever (ASF) continuing to add some uncertainty, especially in regards to future trade. However, the price falls have lessened in recent weeks, perhaps suggesting some seasonal uplift in demand is beginning to meet the rising supply levels. Across the EU, prices have been under varying amounts of pressure, with the Netherlands the only major producer to avoid declines over the latest four-week period. Prices in Spain and France recorded declines of €8 and €3 respectively. Meanwhile in Germany and Denmark, more modest decreases of around €1 were recorded. Prices in Belgium had been declining sharply since the announcement of an ASF outbreak, although in the most recent period they have steadied somewhat, falling just €1.80. Sterling has had a somewhat turbulent ride over the past few days as Brexit announcements have been made, which will affect the next set of prices from the European Commission. Prior to this, in the four weeks to 11 November the pound had strengthened slightly against the Euro, with the latest EU reference price in sterling terms standing at 118.59p/kg. 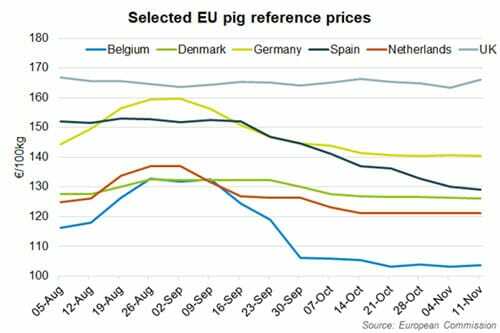 This, combined with only modest falls in UK domestic pig prices, has widened the gap between UK and EU prices to over 26p, which is much larger than the long term average.